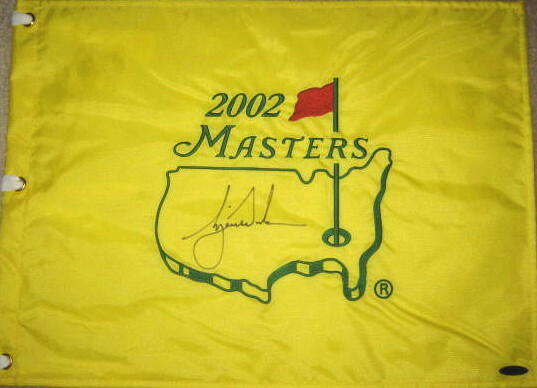 1997 Masters flag and Tiger's first Major. This flag is very rare and has recently sold in the $2500-3000 range (Unsigned). 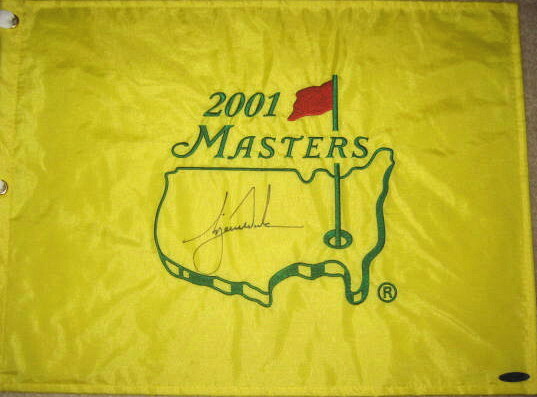 On a side note I attended the 97 Masters for several days and did not even buy one of these $18 flags (my mom did). This flag was signed by Tiger. Value signed $4000++ Be careful I have been told there are now fake 97 flags out there. 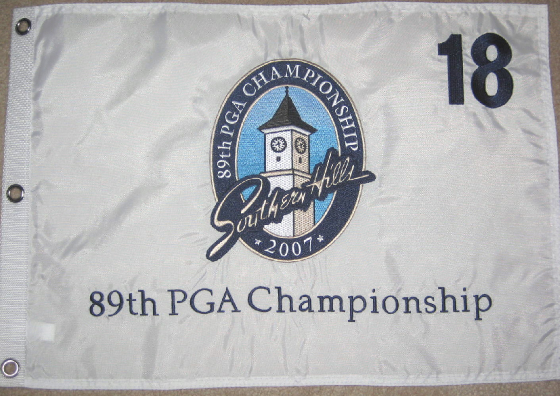 The Very Rare 1999 PGA Medinah Flag. Tiger's Second Major. There are two versions of this flag. One a heavy material and had a Pinny Tag on the back. This one is the second version a thinner material without the Tag on the back. 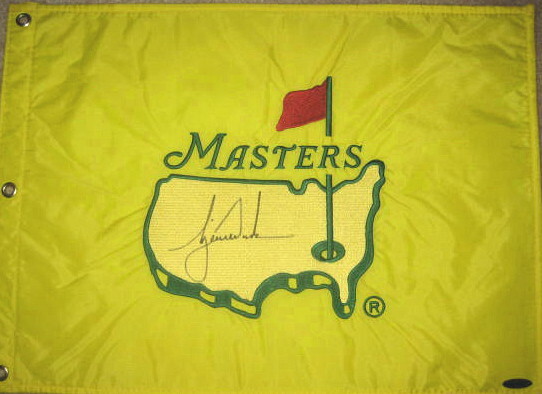 Value is about $2000-2600 One just sold on ebay for $1825 and on 1/16/08 one sold for $2500 I have seen several fake Medinah flags. Some are screen printed: there was not a authentic screen printed 1999 Medinah flag. I have also seen fake embroidered flags also. You can tell by the placement of the Gramets. Authentic flags will have plenty of material on both sides of the gramets. Fake flag will have very little material on both sides of the gramets. 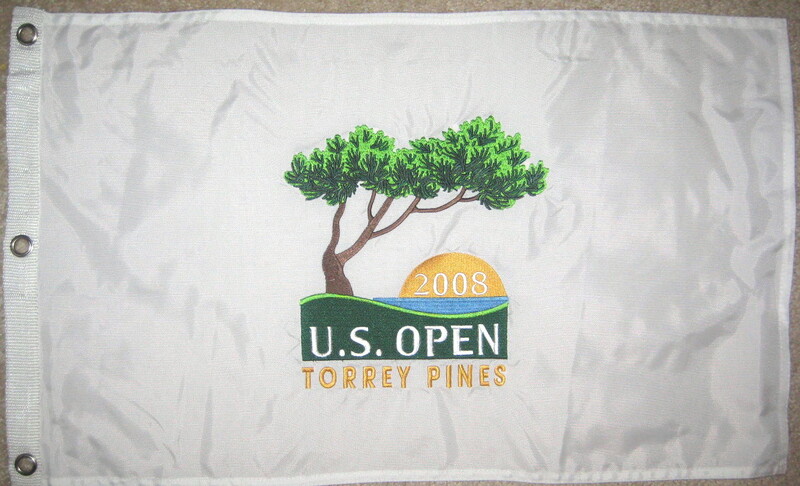 2000 US Open Canvas flag. Another rare flag. Not sure what the value is as I have seen very few sold. I guess $400-600. 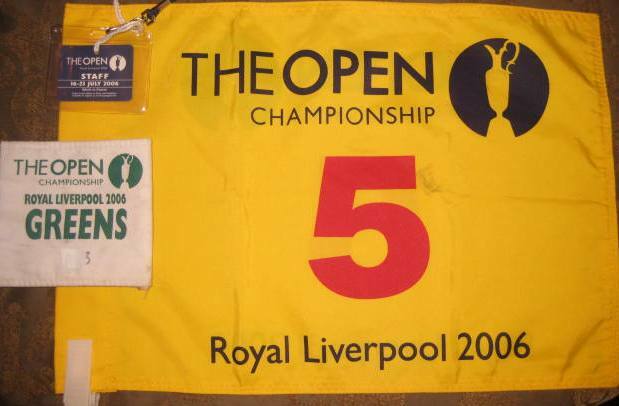 2000 British Open flag. I really like the British Open flags, they are heavy and sharp looking. But I don't think will ever really go up in value a lot, as they don't stop making the flags. You can still go to the British Open website and still purchase 1995 Flags, etc. With all other Major flags they stop making them once the event is over or until they are sold out. I'm very proud to own a British Open Course Used flag used during the 2006 British Open which Tiger Woods won. This is a photograph of the above flag with Stevie and Tiger!